Installing a 220-volt 50-amp electrical service requires a few unique safety features. The voltage in 220V service is twice the voltage in a standard household duplex receptacle. The 220V service powers high demand equipment such as dryers, electric ranges, three-phase motors or welding equipment. Because this equipment creates increased power drain, even the smallest imperfection in the supply circuitry can create problems or safety hazards. ROMEX® cable is rated by the diameter of the individual conductors. ROMEX® used for a 50-amp electrical circuit must be of sufficient size to carry electric current without overheating. Solid conductor 6-gauge, or 7-gauge stranded conductor copper wire is the minimum size for 50-amp electrical service. 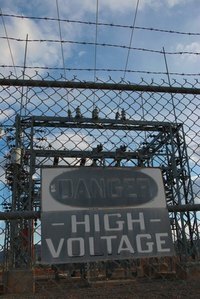 Copper wire is the optimal conductor for 50-amp service. Other conductors such as aluminum or steel should not be used in 50-amp electrical circuits. The electrical industry uses two types of ROMEX®. Type NM ROMEX® features insulated electrical conductors covered by a thin thermoplastic casing. Type UF ROMEX® is manufactured by completely encasing each electrical conductor in solid polyvinyl. When burying ROMEX® for 50-amp electrical service, type NM must be run inside a metal or plastic conduit. Because type UF provides higher levels of moisture protection, type UF cable can be buried without a conduit. While conduit is not required for type UF cable, installing this cable in plastic or metal conduit provides additional safety levels, which is advantageous over the lifetime of the electrical service. Never splice 50-amp 220V service. Install continuous cable runs between the point at which electrical service enters the building and the line's termination point at a remote load center. Because of the increased power supply in a 220V service, splices become a point at which higher resistance forms, and therefore excessive heat builds up. If a hot spot develops, the 220V service line can melt the insulation, or surrounding protective casing; this can create an electrical short, or a risk of personal electric shock. Observe the following safety tips when installing 50-amp electrical service. Never work with ROMEX® cable which is connected to the power supply, or breaker panel. Always install and bury ROMEX® cable before connecting it to the power supply. The last step when installing any electrical service is connecting the cable to the power supply. If the ROMEX® cable is buried, dig a 4 inch wide and 6 inch deep trench. Excavate the trench entirely and thoroughly before burying the cable. Never use a sharp metal tool to push the cable into a poorly prepared trench. The tool could damage the ROMEX®'s insulation. Finally, if burying the ROMEX® cable, strongly consider installing the cable inside plastic or metal conduit. Even though type UF cable is rated for exterior burial without conduit, the conduit provides an added measure of safety, which will translate into longer trouble-free usage.